I’ve had opportunity to go hiking with archaelogists, geologists, biologists and botanists and it’s always a special experience. Each sees the landscape with eyes very different from mine, discovering something new and surprising at every step and inevitably infecting me with his or her enthusiasm and passion. Today I experienced that same stimulation of excitement and wonder while wandering the shelves of La Perla Bookstore with its owner, Gerry Smith. 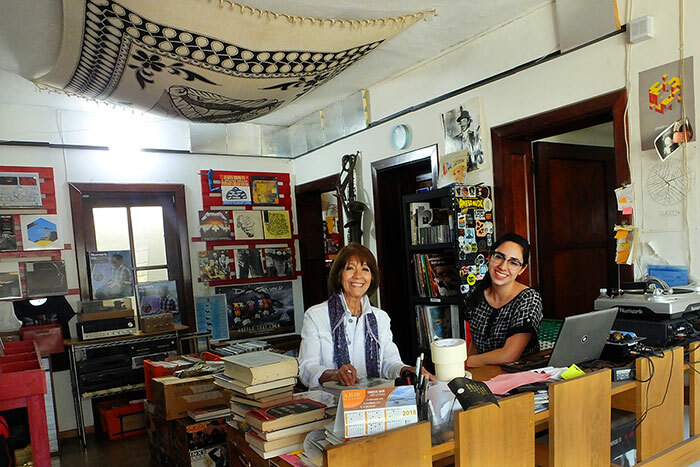 La Perla Books and Records is located on Pedro Moreno near Chapultepec. The entrance is small and unassuming, but as you climb the stairs you are greeted by the faces of Bob Dylan, Crosby, Stills and Nash and other rock legends. These posters and album covers make it clear that La Perla is both a record and book store, reflecting the expertise and preferences of its two owners, Gerry Smith and Ernesto “Bola” Domene. While Smith fills his rooms with good books, Bola’s collections reflect his expertise in Rock Music. “Bola was the drummer for Mexico’s hottest rock band of the 1990’s, La Lupita,” Smith told me. He continues on today as a member of the rock-pop band “Rostros Ocultos.” La Perla has around 10,000 new and used disks for sale. Vinyl records are a specialty, but they also sell CDs and even a few 8-tracks. I wandered out to the store’s balcony overlooking Guadalajara’s Zona Rosa and asked Gerry Smith to tell me a bit about himself. 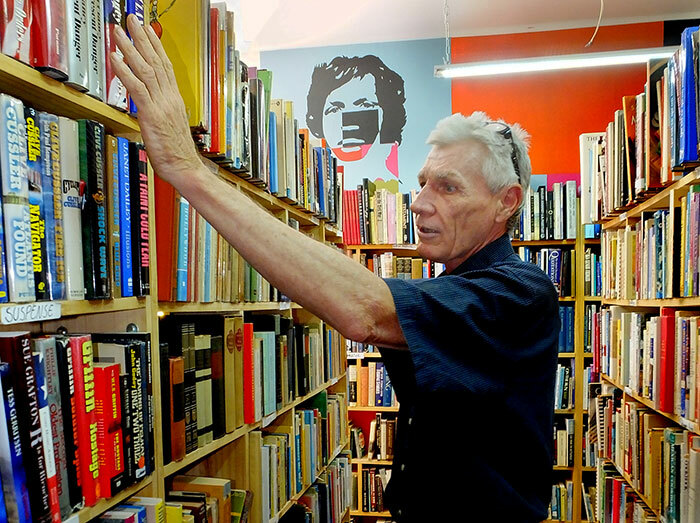 Smith met Bola Domene, set up a six-foot bookcase at La Roma Records (which later changed its name to La Perla) and for five years the shelves of books have been expanding, until, today, he estimates he has a minimum of 15,000 books. 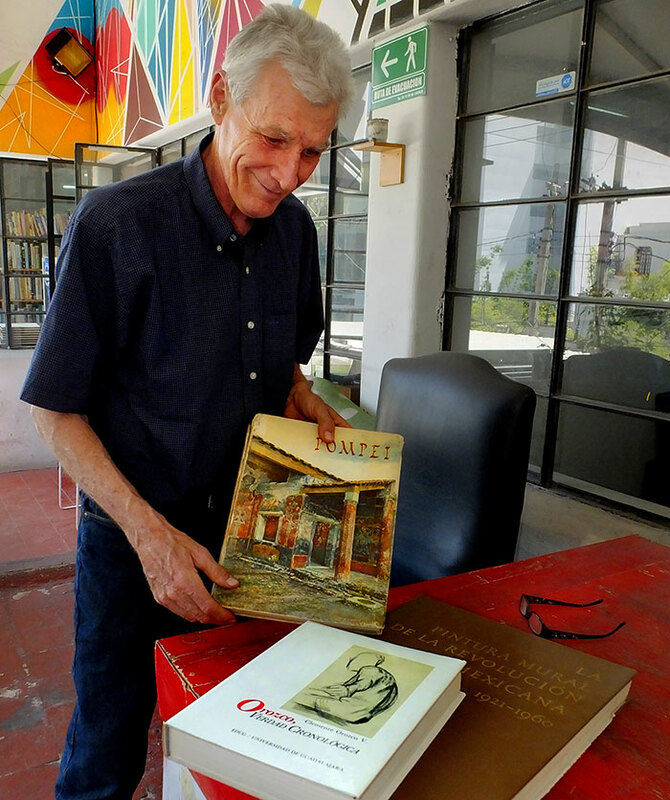 “I haven’t found a larger or better collection of English used books anywhere else in Latin America,” Smith was told by Clemente Orozco, a frequent book browser at La Perla and grandson of Mexico’s famed muralist, José Clemente Orozco. Whether you are looking for rare books or just a good read, I think you’ll discover that La Perla is truly a pearl without price. Currently the bookstore’s Facebook and Web sites "English Books Guadalajara" are undergoing major reconstruction. Send inquires to laperlabookstore @ gmail.com (remove the spaces). La Perla is located at Pedro Moreno 1530 on the second floor, Tel 33 1525 3015. It’s open Monday to Saturday from 11 AM to 9 PM and everyone there speaks English. On top of that, they actually have a couple parking spots in front!